When I first reviewed the iPhone I talked about its battery life as being borderline for the business traveler. Whenever I travel with the phone, it always needs a charge by the time my first dinner meeting rolls around. Steve Jobs originally proclaimed that battery life and chip size were both reasons that the first iPhone didn't have 3G support, the question is does the new iPhone offer 3G performance without the battery life penalty? Unfortunately, as Apple doesn't design any of the chips or battery technology that goes into the iPhone, it doesn't really have much control over things like 3G battery life. And thus, the iPhone 3G suffers like any other smartphone when operating on a 3G network. At 197 minutes, the iPhone 3G can keep you browsing for a little over 3 hours before completing dying. That's with no additional phone calls or anything else going on in the background, just constant surfing. The problem is that this is a very realistic scenario for many users. If you're out of the house and stuck somewhere without a laptop, you'll want the speed of 3G but the battery life will mean that your surfing experience is almost half as long as it would be on Edge. Granted, you can load pages faster in the same amount of time, but you'd have to load pages around twice as fast on average to equal the same productivity. In our 3G performance test from earlier this afternoon we found that while 3G can easily be up to 10x faster than Edge, the real world browsing performance will generally be significantly slower than that. 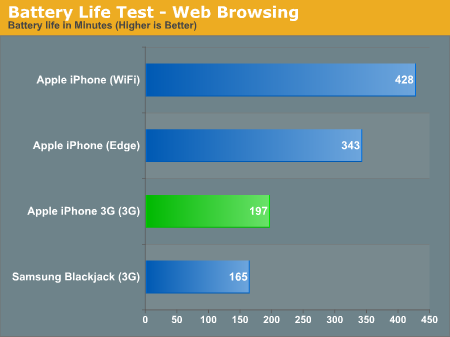 Only our AnandTech loading test was able to perform at the required 2x speed to make the iPhone 3G, in 3G mode, more energy efficient than running it in Edge. The Facebook and Digg tests both weren't fast enough to balance out the additional power draw. Sure the battery on iPhone 3G is not that great, but what can we do? We want small size phones, powerful features and lengthy battery life. Prior to owning the iPhone 3G I had the HTC Mogul Pocket PC (WM6). The Mogul was an absolute monster at eating batteries, despite its bountiful 1600mah battery (that was quite heavy). The iPhone 3G on the other thand is much slimmer, lighter and FASTER with better battery life. While waiting in line for my second iPhone (got the last one at the apple store on the 11th) for 7 hours the phone drained the battery to near death. This was with downloading and playing games most of the time. Today I went from a full charge to 20% in 10 hours with several phone calls made, 2 hours of ipod use and lots of game playing and toying around. The bottom line is this. If you play with the phone non stop you will get about the claimed 5 or 6 hours of use and will need to charge it a few times a day. But if you use the phone like a normal human being you should only need to charge it once a day and for infrequent use, every other day. To be safe, charge it every day. Posting battery life comparisions is pretty meaningless without us knowing what batteries are being used. Is the Blackjack using its default tiny 900mAh, or an extended one? The original iPhone has a 1400mAh battery, so of course its life would be much larger than other phones without extended batteries. Any idea what the 3G iPhone uses? Best evidence so far is 1150mAh. I mean seriously, its a niche market. You might as well do a review of a Toaster that is colored Pink while you are at it. The instinct and other phones that run WinMob trounce this toy!